Once a week, sometime after lunch, an ice cream truck drives around our building. From our office, we can all hear the familiar children’s songs playing from the truck’s music box. 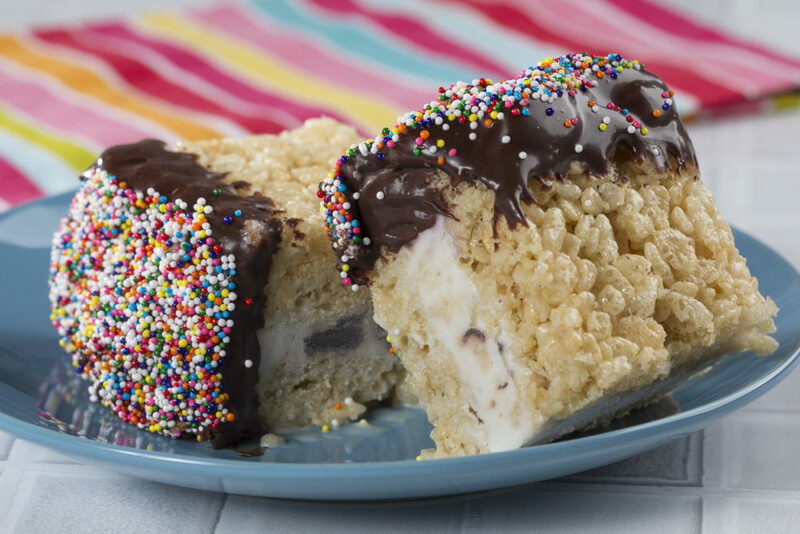 And every time we hear it, I find myself reminiscing about all of my favorite ice cream treats…like ice cream sandwiches. I’m going to be honest with you, I’m not loyal to any one ice cream treat. I know some people who will only get the ice cream tacos or the fruity popsicles. Other people are die-hard cone fans. I’m not picky. I will eat ice cream in any of its beautiful forms. 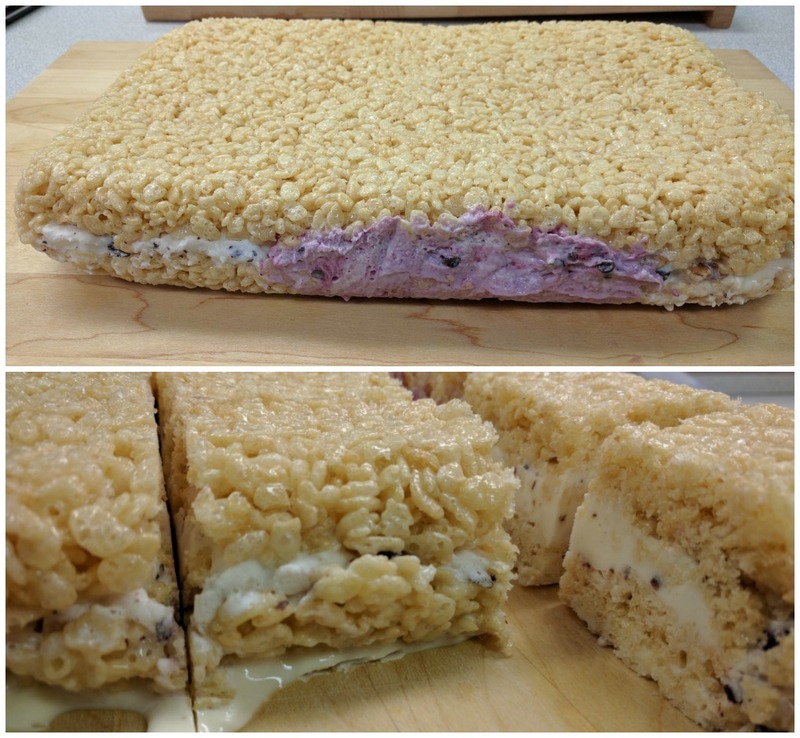 And today, I’m showing you one of the greatest dessert mash-ups of all time: ice cream and crispy rice cereal treats. Oh yeah! The best thing about these? They’re 100% customizable. 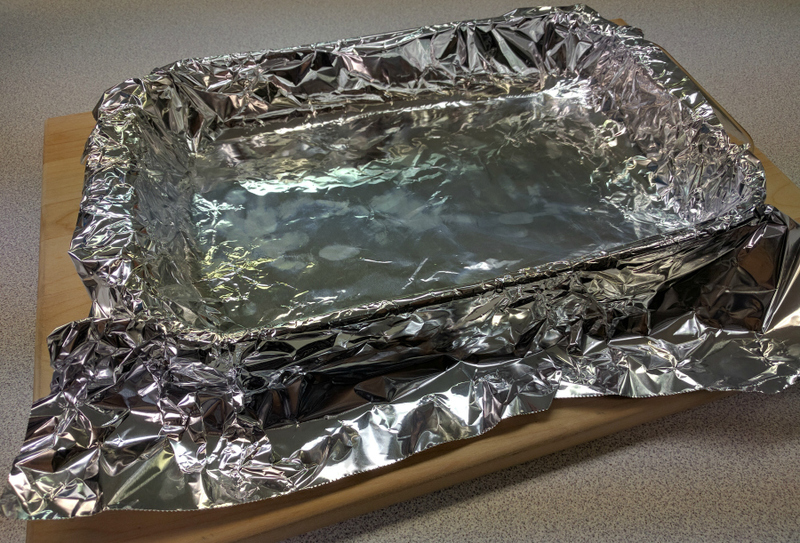 Step Two: Line two baking dishes with foil, making sure to leave some of the foil hanging over, so you can easily remove your treats later on. Spray the foil with some cooking spray. 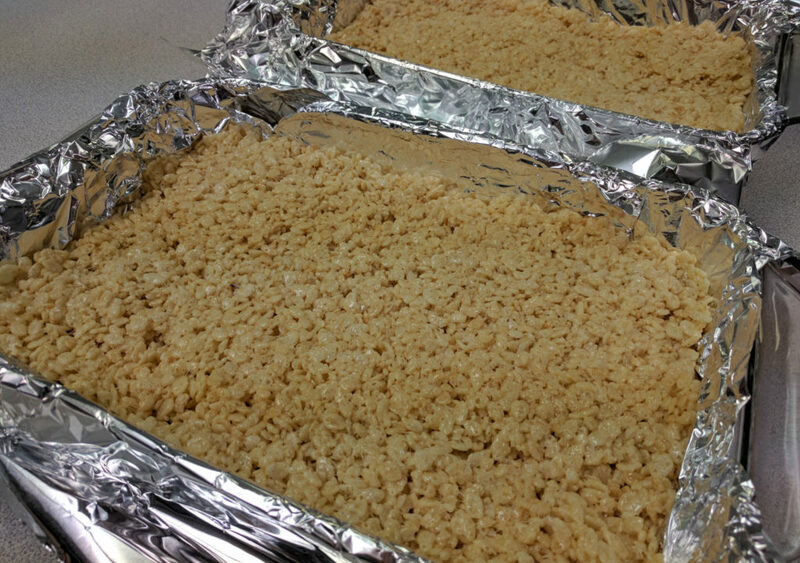 Step Three: Make your crispy rice cereal treats. 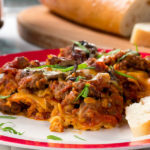 I have a confession, I’ve never made these before. I’ve had my fair share of them over the years, but I’ve never attempted them. I don’t know why – it’s super easy to do! Just melt some butter in a large saucepan, toss in your marshmallows, stir and stir until it’s all melted. Then, take the saucepan off the stove and add your cereal to all that melty marshmallow deliciousness. Combine well and voila! 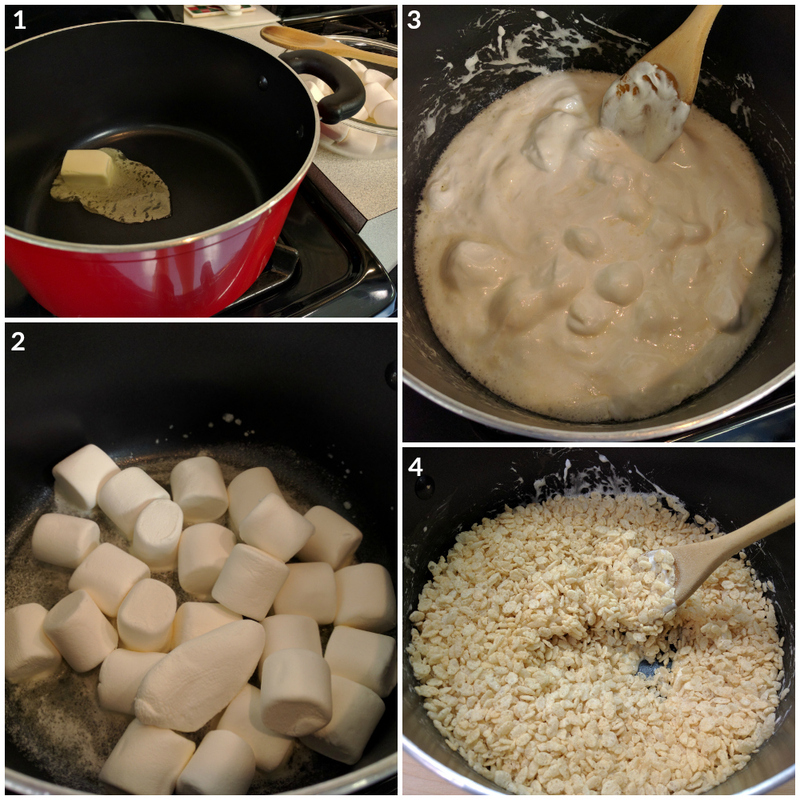 Step Three: Once you’ve got your crispy rice cereal all mixed up, you need to work quickly to divide the mixture in half and press each half into your prepared baking dishes. I suggest spraying some cooking spray on your hands, so that the mixture doesn’t stick too much. And don’t worry, by the time you’ve mixed it all up, it’s not so hot that you’ll burn yourself! Step Four: While the treats sit out a bit to cool completely, take your ice cream out of the freezer to soften. Then, spread the ice cream evenly over one of the cereal mixtures. 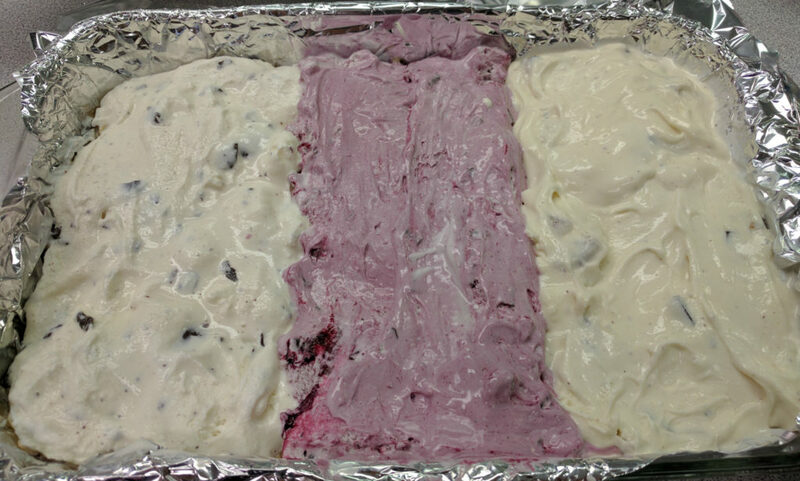 As you can see, I used three different flavors to make mine. 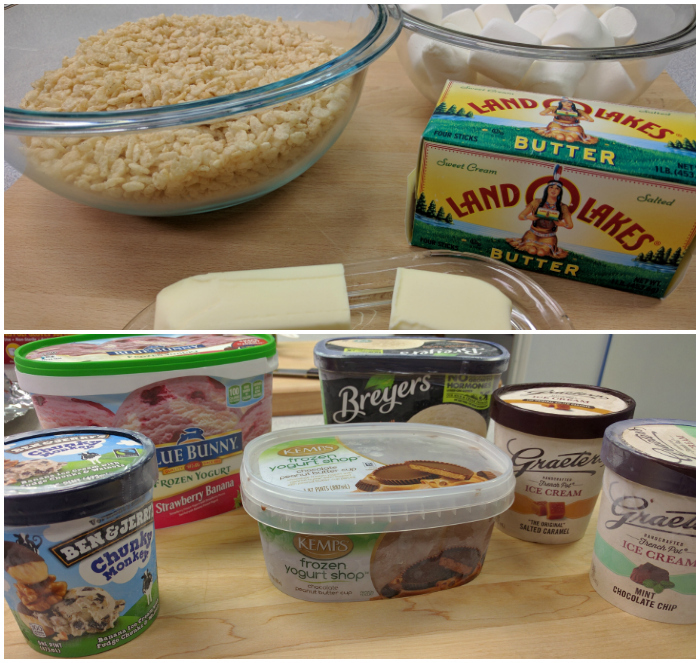 I figured that everyone in the Test Kitchen has their preferences, and I wanted to give them some choices. Step Five: Place the second cereal mixture over the ice cream, using your foil “handles” to help take it out of the dish, and gently press down. Cover it up and let it freeze for at least 4 hours, or until firm. When it’s firm, take it out of the baking dish (using the foil again) and cut into squares. Step Six: Whip up some ganache! All you’ve got to do is bring some heavy cream to a boil, pour it over a bowl of chocolate chips, and stir it until it’s smooth. Let it sit for a little to thicken, and then get to dipping! 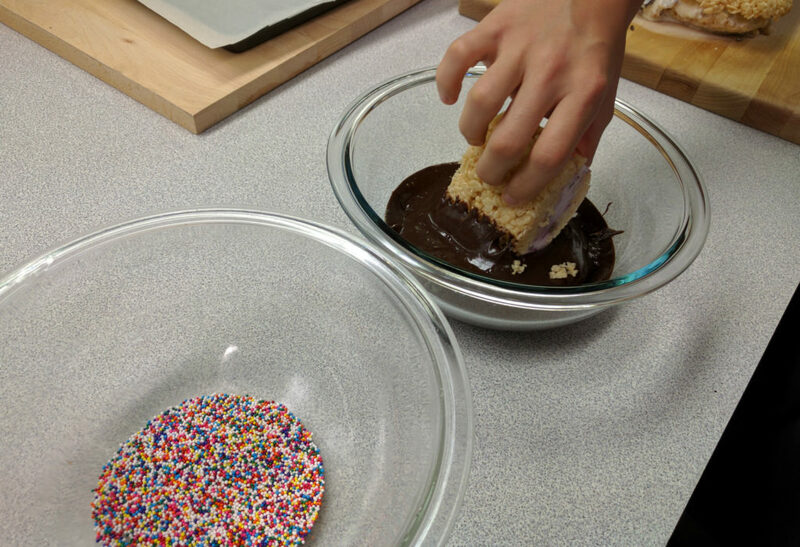 You can even add some sprinkles or nuts on, after you’ve dipped them in. What I like best about these (besides how good they taste) is that you can make them anytime and store them in the freezer for when you’re craving a yummy summer dessert. 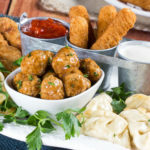 They’re also a great option for a pool party (just make sure you keep them in the freezer until they’re ready to eat!). What’s your favorite ice cream truck treat? This conversation is sponsored by National Frozen & Refrigerated Foods Association. The opinions and text are all mine. For more great ice cream recipes visit EasyHomeMeals.com or MrFood.com.